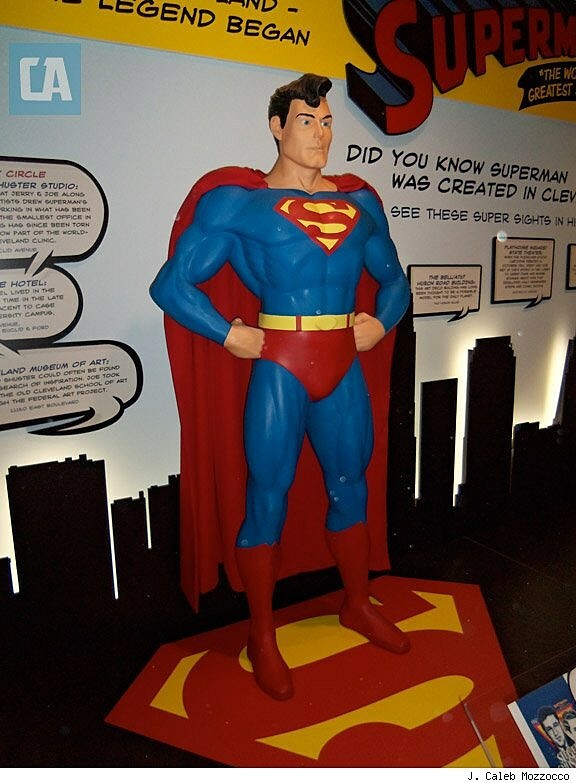 Krypton, Smallville, Metropolis and Cleveland are all famous homes to Superman. The only one of those four locales you can can actually visit (by virtue of it being a real place and all) is Cleveland, Ohio, and, ironically, it's the city that's the least popularly associated with the Man of Steel. Fortunately for Cleveland natives, a new permanent exhibit was unveiled and dedicated at Cleveland Hopkins International Airport earlier this month that ought to go a ways toward helping to put the city on the radar of Superfans around the world.The center piece of the $45,000 exhibit, funded and created by The Siegel & Shuster Society, is a slightly-larger-than-life statue of Superman with his hands on his hips, striking his famous George Reeves-inspired pose. 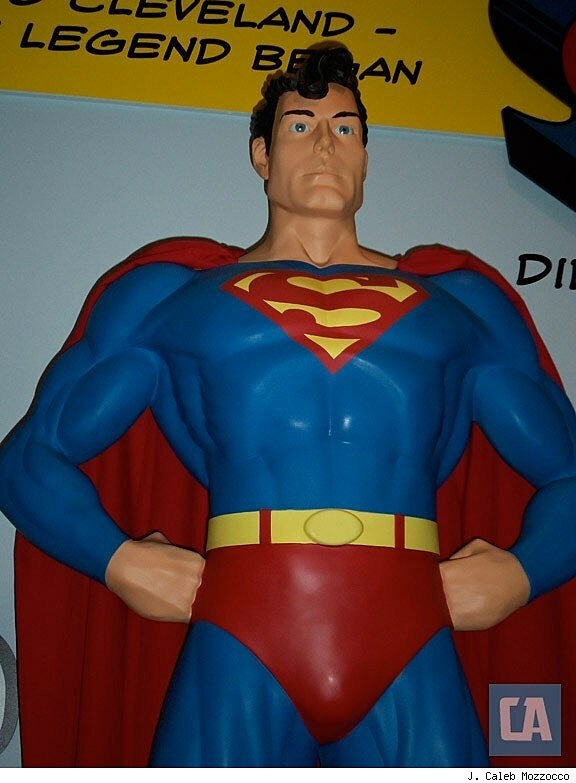 He's in his familiar red-and-blue togs, a far cry from the armored, shorts-less New 52 Superman designed by Jim Lee, as well as from the Superman artist Joe Shuster first drew and which the world first met in 1938's Action Comics #1. If I had to pick a Superman artist whose depiction this Superman most closely resembles, I'd go with that of Dan Jurgens in the 1990s, though it's a strong synthesis of the various film, comics and cartoon Supermen over the decades, one that manages to look just right. The airport Superman stands atop a huge S-shield logo, and behind his head the wall reads, "Welcome to Cleveland-Where the legend began." Big, red and black letters in the familiar Superman type scream the hero's name, with a banner reading "The World's Greatest Super Hero" below it. Just below that? "Did you know Superman was created in Cleveland?" and "See these super sights in his hometown." 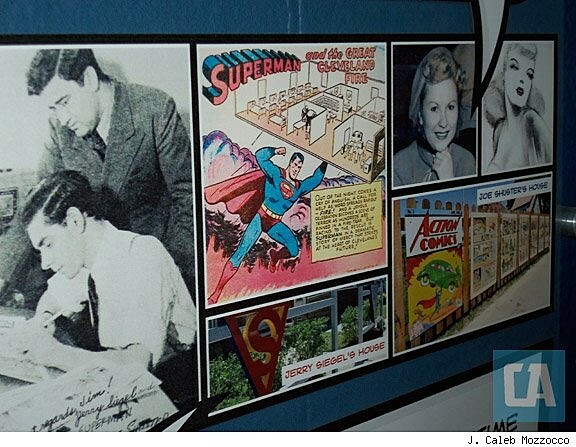 Behind the statue is a silhouetted skyline of the city, and all along the wall are comic book dialogue balloon-like images announcing points of interest in the lives of Jerry Siegel, Joe Shuster and Superman, along with their addresses should new arrivals in town want to take a little Superman history tour. These sites include the Bell/AT&T Huron Road Building, an "art deco building long thought to be the model for the The Daily Planet; The Cleveland Public Library, to which the pair of teenagers used travel almost every day by street car; and several locations in the Glenville area, where they grew up, attended high school, created Superman and met Joanne Carter, the teenage model hired to pose for Lois Lane and who eventually married Siegel. 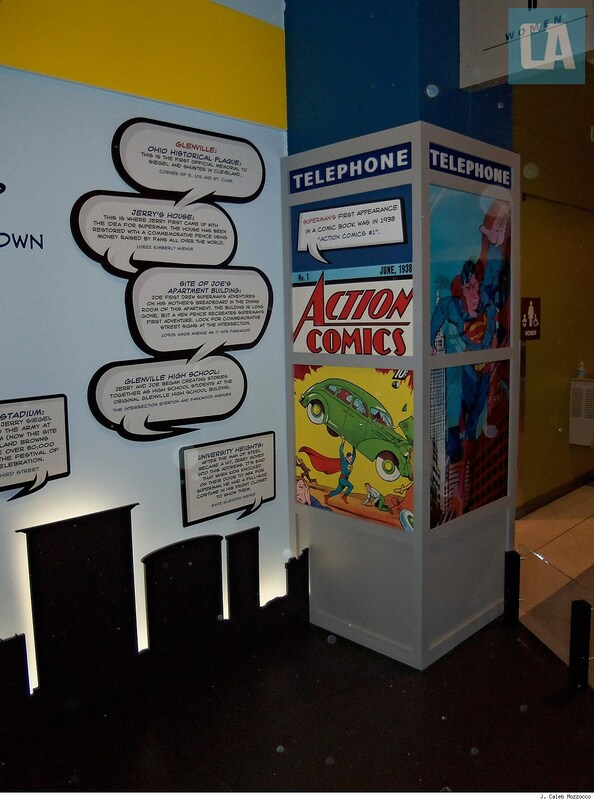 On the right border of the exhibit is a mock phone booth in which can be seen an image of Clark Kent pulling open his jacket and shirt to reveal his Superman costume. 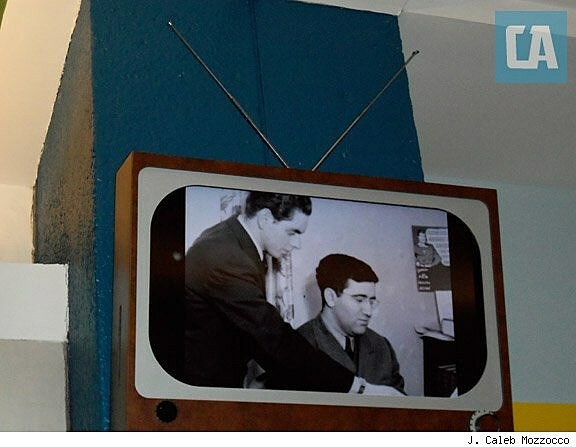 The left side features a television set constantly playing a never-ending loop of a short documentary produced, co-written and narrated by Mike Olszewski, the president of the Siegel & Shuster Society. The film was played during the penultimate part of last Thursday night's ceremony for the hundreds of fans, media and curious passersby who assembled in front of the podium and wall of high, black-curtained screens obscuring the statue and display. T-shirts bearing Superman's S-shield logo just barely outnumbered blue t-shirts bearing the Society's logo, and one fan arrived with a Green Lantern t-shirt under his blazer (perhaps he was there awaiting a connecting flight to Coast City). The short, upbeat film tells the most basic elements of the real story behind Superman, focusing on Siegel and Shuster's original acts of creation and the meteoric rise in their characters' popularity, including an appearance at the 1939 World's Fair, the Macy's Thanksgiving Day Parade, the newspaper strip, the popular radio show and the debut of the Max Fleischer Studios' Superman cartoons -- an occasion Siegel and Shuster marked in Cleveland by setting up a mini-studio in the lobby of a local playhouse to demonstrate before an audience of children how Superman comics were made. Olszewski's film was filled with photos of Siegel and Shuster and early Shuster artwork, as well as some stock footage and clips from various Superman movies, TV shows and cartoons. It was 100% completely controversy-free, with the ownership of Superman and the on-and-off legal disputes between the creators (and now their heirs) and the publisher who controls Superman not even mentioned. No one mentioned National Comics publishers Harry Donenfeld and Jack Liebowitz or the $130 page rate the young comics-creators got for Superman. National, DC Comics and Warner Bros. weren't ever mentioned in a negative light, if they were mentioned at all. DC only came up in the course of anecdotes during the various speeches. For example, in recounting how the Society came about, Olszewski explained how a faction of the group went to New York to meet with DC representatives to get their blessing before officially forming; they got it with the two conditions that the group be a non-profit, and that it not use the word "Superman" in its name). The event kicked off with the Glenville High School Marching Band's rendition of John Williams' Superman theme from the 1978 film (which members of the Cleveland Jazz Orchestra would reprise as the curtains came down and the exhibit was finally revealed). Cleveland Mayor Frank G. Jackson, City Councilman Jeff Johnson (who now represents the Glenville area) and airport officials all gave short speeches, as did Olszewski, Siegel's cousin and Society founder Irv Fine, and finally Laura Siegel Larson, the daughter of Jerry and Joanne Siegel, who now resides in California (Siegel Larson would make more news in comics circles a few days later, as comics news sites picked up on her open letter responding to the latest development in the long and ongoing legal battle between Warner Bros. and the Shuster and Siegel families). "My dad, my mother and Joe would have been delighted, honored and humbled," Siegel Larson said during her speech, at another point noting they would have been "over the moon." As soon as her speech was finished, she was walked over to the display for its unveiling, and was among the first of scores of people to have their photos taken in front of the staring, primary-colored super-hero statue in the course of the next half hour or so. People posing for photos with Superman should prove a pretty permanent phenomenon at the Cleveland airport.